The mood around Hillsborough has taken a sharp turn for the worse since the last international break. A cloud of negativity has engulfed Sheffield Wednesday after three consecutive Championship defeats. There is plenty of doom and gloom around the place, with manager Jos Luhukay receiving criticism for his team selection and tactics. The onus is now on Luhukay and his under-performing players to reverse their flagging fortunes. 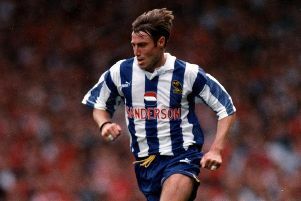 Former Owls defender Jon Newsome told The Star: "Whatever people think, professional footballers have a hell of a lot of self pride. "I read a lot of nonsense about 'they don't care' but if you go and sit down and speak to the players, they will be hurting immensely after losing three times on the spin. They will be hurting and wanting to put it right. "No one wants to be deemed a failure. When you walk off that pitch on a Saturday and you have been beaten, you have effectively failed. "Footballers hate that just as much as supporters do." Wednesday have an opportunity to make amends when they entertain fourth-placed Norwich City this Saturday. "There has to be a reaction in the right manner," said Newsome, a regular BBC Radio Sheffield summariser. "They can't just run around headless chickens. "There has to be a positive reaction. "But it is also trying to get a reaction out of people whose confidence is at a low ebb and that is the difficult part. "You've got players who are down in the dumps and th at know they are not playing well." Luhukay bemoaned missed opportunity and defensive mistakes after Saturday's defeat to Birmingham City. Defensive lapses in concentration have piled the pressure on Luhukay, with the Owls having shipped in six goals in their last two outings. It is well-documented Wednesday are the only team who have yet to keep a clean sheet in the Championship this season. Newsome, a defender during his playing days, said: "A lot of it is to do with confidence. When you are a confident player, you make decisions on the pitch in a nanosecond. You do things automatically, especially defending. "When you are a confident defender, you know when to go tight, when to win the ball and when to drop off. You make those decisions immediately. "Football is all about making decisions. You make hundreds and thousands of decisions every game. When you are confident, you make those decisions quicker because you are confident in your own ability. "When your confidence has taken a bit of a kicking, which some of Wednesday's players have, you can second guess yourself and make the wrong decision." Things do not get any easier for Luhukay's side as Norwich head to S6 on the back of just two defeats in 13 matches in all competitions. Newsome, who was the Canaries’ first ever £1m signing in 1994 and went on to make 62 appearances for the Norfolk club, said: "Norwich are absolutely the polar opposite to us. We have lost the last three and they have won the last three. "It is going to be a tough game. It is probably a bonus that Jordan Rhodes can’t play because he has scored a couple of goals for them. That's an advantage for us. "But we have to get our own house in order. We have to sort out own style of play and cut out the individual errors which are costing us. "We've had all week to work on the training field to work on the defensive side. We have to be more difficult to beat. "We have conceded three goals in each of the last two games so we are having to score four goals to win a match. It is impossible. Despite their recent dip in form, Newsome remains confident Wednesday will turn things around. "You don't go from a good team to a bad team overnight," he said. "We went to Aston Villa and Bristol City won.